I am so excited to share this recipe with you guys, it was incredible. I made it a few weeks ago and have been dreaming about it ever since. The whole family loved it and we all ate seconds. At first glance the recipe may seem complicated but I promise it is not. The hardest part is blending the onion, garlic, and ginger and cooking the meat. After that your pot or crock pot does the work for you. We served ours over white rice and you could brown rice but I really do recommend white rice for the recipe. I think white rice just soaks up the sauce better and brown rice has more of a nutty flavor. The sauce on this dish is the real winner, I am not kidding Sterling and I sat and ate it like soup it was that good. You can use any veggies you want in here, the original recipe called for snap peas, but I did a mix of broccoli and bell peppers. I also let this simmer for almost 3 hours. In the bottom of a slow-cooker placed on a burner heat olive oil and melt butter. Add pureed aromatics and stir well. Cook for a few minutes, then add spice blend. Cook for 2-3 minutes, stirring constantly. Whisk flour with coconut cream until smooth and add to the chicken. Stir well. Add frozen broccoli and peppers or other vegetables of your choice. Cook for another half an hour or until you deem the chicken cooked and the vegetables hot. This time of the year with all the hustle and bustle, and holiday madness I think it is especially important to be thankful and grateful for what we have. I am trying hard to teach my children this. We are so fortunate compared to so many others. It is easy to get caught up and forget the real meaning of Christmas. It is also easy to get caught up thinking about the challenges and negative parts of our life. I find it helps me stay centered to take a moment to sit and quietly thank God for all I have and have been blessed with. I mentioned these gratitude beads and prayer beads last year but this time of the year I tend to use these beads more often. I always let Sterling help me, each day we make a point to sit and say what we are thankful for and pull a bead (or several) aside. It is a nice reminder especially during this time of the year to be thankful. As overwhelmed as I feel, I am so lucky, I really do have such a blessed life. There are so many people fighting way bigger battles out there. I can't help that I am a worrier by nature (although my dad claims I can change this) but I can change my outlook on things and choose to look at the positive side and be grateful. I read a great verse in my Jesus Calling the other day about starting your day thanking God, such a good reminder. Often we pray for help and things we want but sometimes it nice to just stop and Thank God for what we have. I try to sit with Sterling and we each pull back a bead and say what we are thankful. 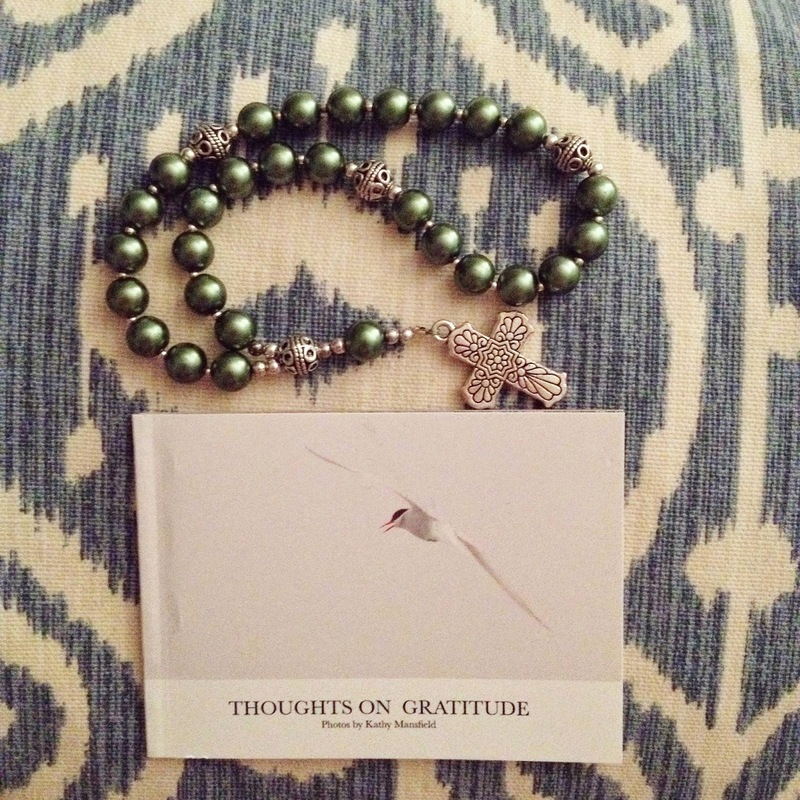 One of my mom's dear friends makes and sells these prayer/gratitude beads. They are such a wonderful gift for someone. A new mom, a teacher, someone going thru a rough time, a fab stocking stuffer. Anyone can benefit from these gratitude beads. She will hand make them in any color you want. I love the idea of gifting these to friends and family. I am thinking of doing these as end of the year gifts for Sterling's teachers. I love the idea too of bringing these to new moms post baby. Such a wonderful idea for anyone to be thankful. The beads start at $22. You can email my mom's friend Kathy at Heron39@aol.com to see a full catalog of the beads or to place an order. The beads usually come with something attached to the end think a disc or cross etc but my children ripped mine off- go figure:) They still serve a purpose! They come in so many different colors and materials and they come packaged in a sweet little bag with a small book filled with some gorgeous photography and inspirational quotes. I am telling you guys this would be an amazing stocking stuffers! Now THAT recipe is one I have to try!! I really need to get a food processor... I suppose I'll put one of those on my Christmas list. Glad you posted this recipe! That recipe looks delis! Def going to try. And I love the idea of the gratitude beads. It would be a great gift! This sounds amazing! Pinning and going to try soon. Had your chicken spaghetti last night for the first time and even my kids loved it! Success in my book! Mmmm I want to try that recipe soon! Also, what a great idea to gift the gratitude beads. How sweet it is that you and Sterling do that regularly together! Tried the recipe last night- SO good! Thanks!! A good time of year for us all to remember to be grateful.